I have a US passport because my dad is American. I’ve never lived or worked there in my adult life, because I am British, so I didn’t know you had to pay tax on everything, because the Internal Revenue Service does not believe there is such a thing as not belonging to America. They’re an empire. Everywhere else in the world is foreign, so you have to send your money back to the homeland — even if it’s not your home. Lot’s of stay-down linking work going on. Sometimes I worry it’ll never work. While Becka has been caving, I’ve been working through the weekends in the empty bedrooms of Bull Pot Farm, (occasionally interrupted by horrible hangovers). Here’s the checkin changes of a beast of a file. It’s like building a dry stone wall: I can’t remember any of what I’ve done; I only know what move is next. It’s an incremental procedure. New problem cases crop up, and you go away, have a cup of tea and come up with a solution, and keep repeating in the hope you don’t run out of ideas before it gets fixed. 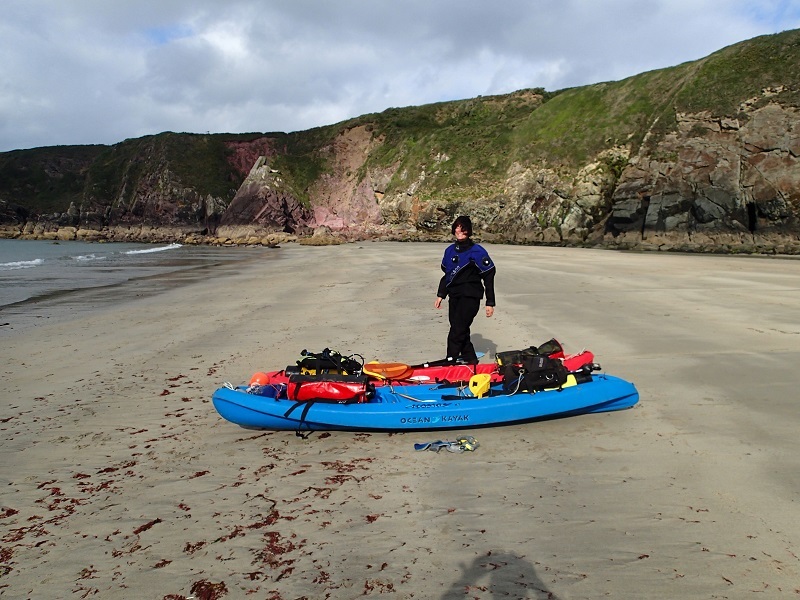 We went away for some kayak diving in Pembrokeshire over the weekend. I wanted to dive on the north coast from St David’s, but the north wind had picked up, so we directed ourselves to the south coast and going out of Solva after camping on Friday night in a layby to the east of Felindre Farchog on the A487 that had bogs. A useful discovery after drawing a blank going down some of the single-track back roads near there at one in the morning. There’s not much to report on the diving. No amazing sights. Not a conger eel, or dolphin, or trigger fish, or even a spider crab. 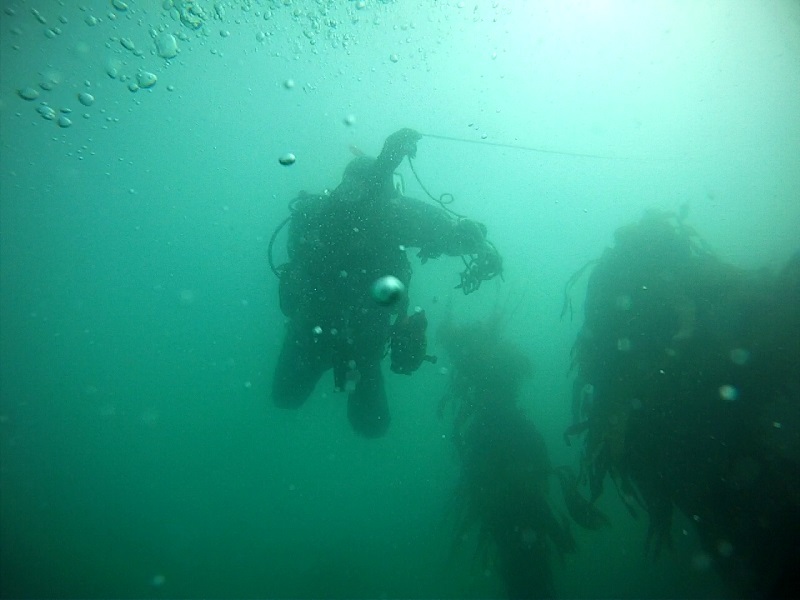 It was mostly kelp, gravel, silt, and a few pollacks. Everything had gone away for the winter even though the water was as warm as it is at any time of the year. The energy for life comes from the sunlight, not from heat. The cliffs were empty of birds who had abandoned their ledges that they had spent the spring and summer painting white with guano. 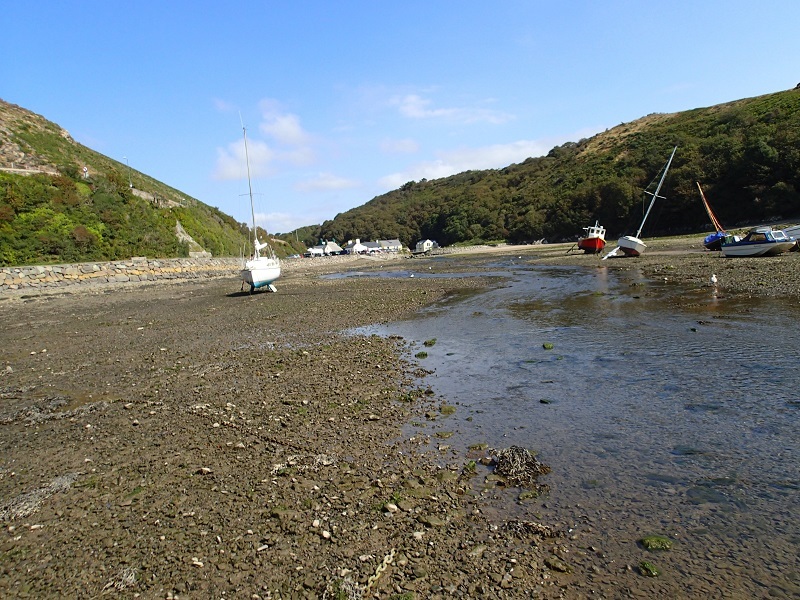 Solva harbour is pretty dry most of the time. After waiting 5 hours for the tide to rise, we dragged our boats out when it was at this level. Becka is unimpressed by this strap coming loose on to which she had tied her canoe for this dive on the south side of Green Scar. There were gusts of wind on all sides of the island, even on this seaward side which was supposed to be sheltered. We did a shallow short dive, then got back on the boats and paddled into the wind to get back to the coast. There had been a slight concern we weren’t going to make it after going off-shore like this, but there wasn’t a problem. 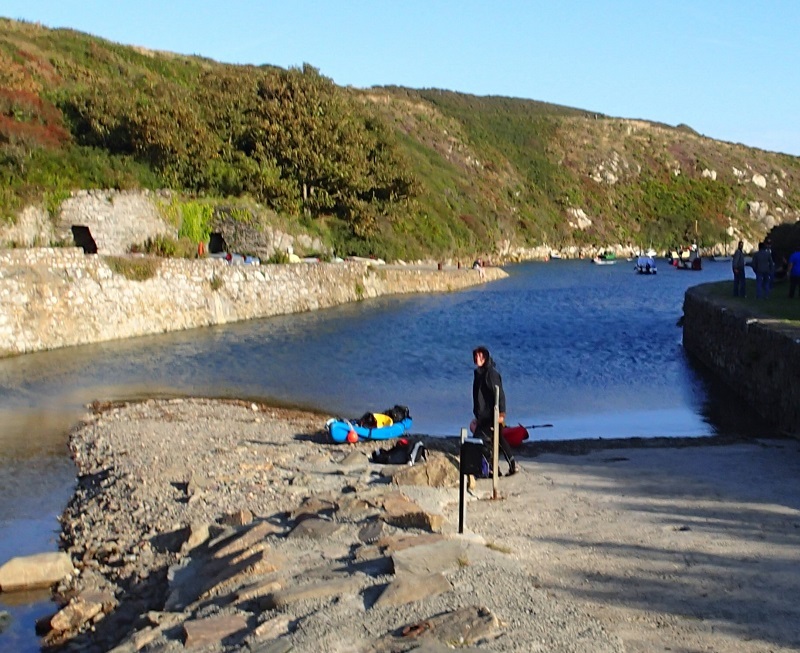 We camped at Cairfai Farm, the low-carbon tents-only campsite south of St David’s on the coast, having left our kayaks on the beach so that we only had to carry the empty tanks up the steps to change them at the car. 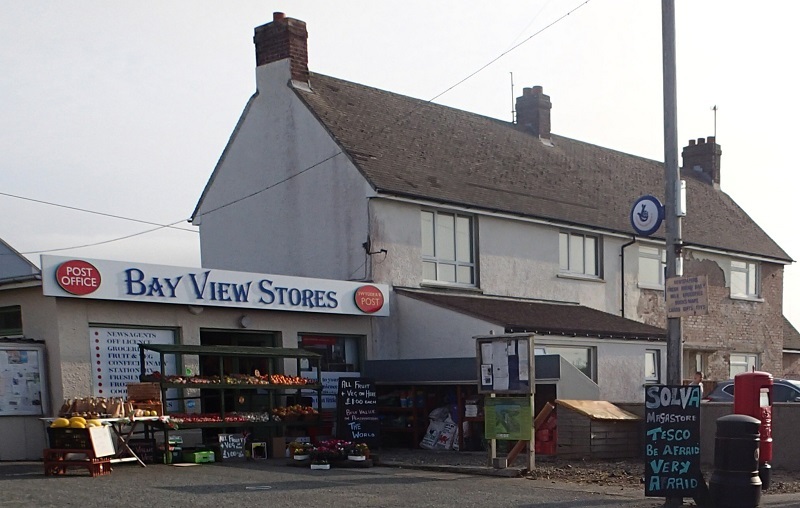 My old set of electronic charts are broken, but after looking at a chart of Ramsey Sound on the wall of a pub I spotted a wreck in Porthlysgi Bay which I could look up accurately on the internet, which meant we could dive the wreck of the St George the next day. I don’t know anything about it, except there were a lot of tall bits of metal which Becka had to thread the kayak anchor line around. 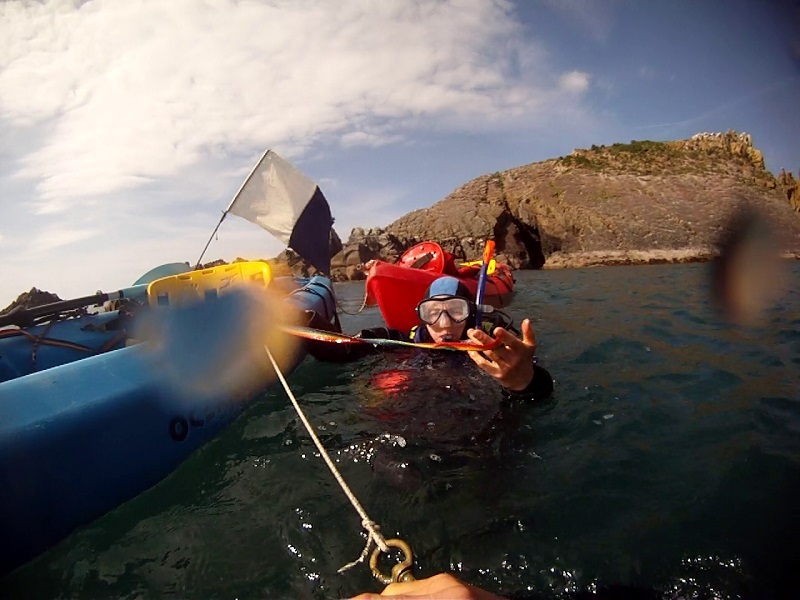 After this, the options were to either drift round on the current into Ramsey Sound, or go back along the coast for a final dive off the east side of Porth Clais where there was a deep section of sea bed close in shore, according to the charts (about 13m). Being chickens, we opted for the latter. I’d also told the coast guard we’d be off the water by 6pm, so there wasn’t much time left. I always inform them now after getting call-outs due to walkers who see us fall in the water and start thrashing around trying to get our kit on before appearing to drown. It was a long drive home via the chip shop in Fishguard. I still need to come back and do that north coast again when it’s in shelter. I got a lot of other more important things I should be blogging about, but what the heck. This is a quick one and I want to relive it. 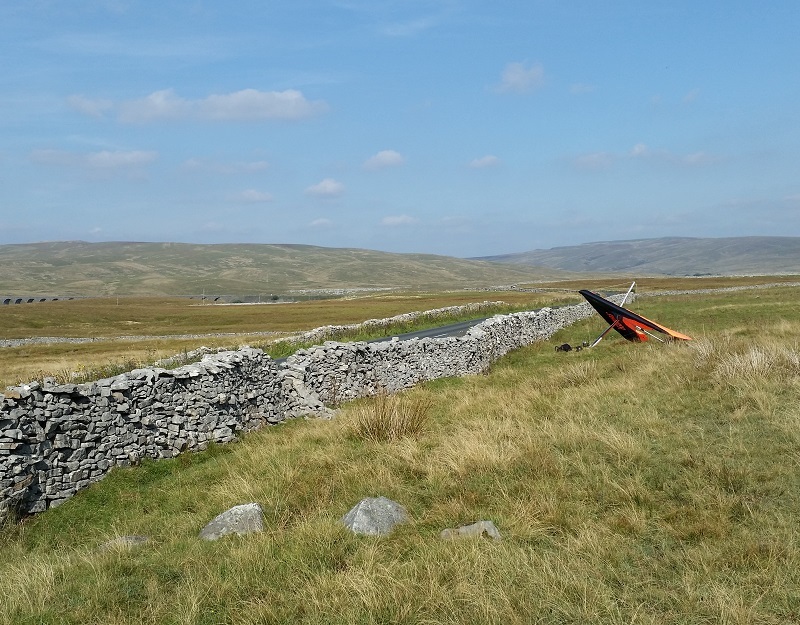 I got out yesterday for a flight on Whernside and persuaded a caver to carry up my harness for me and make sure there wasn’t a crash on take-off because, as usual, I was pretty much alone again. A paraglider did walk up just as I was ready to take-off. 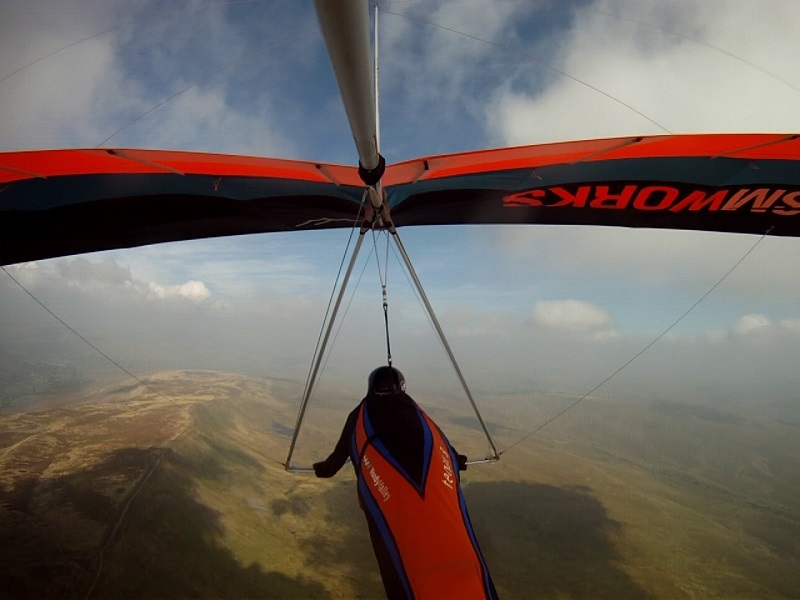 Unfortunately he didn’t join me in the air for very long after he launched half-way down the face of the hill to avoid the wind-speed. 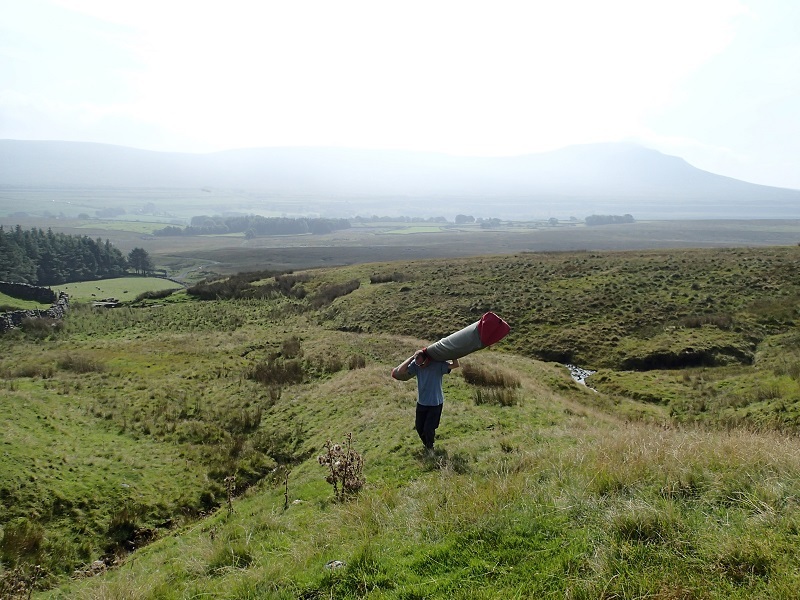 This is the fifth time I’ve carried my glider up this hill. It’s doesn’t feel very far now. 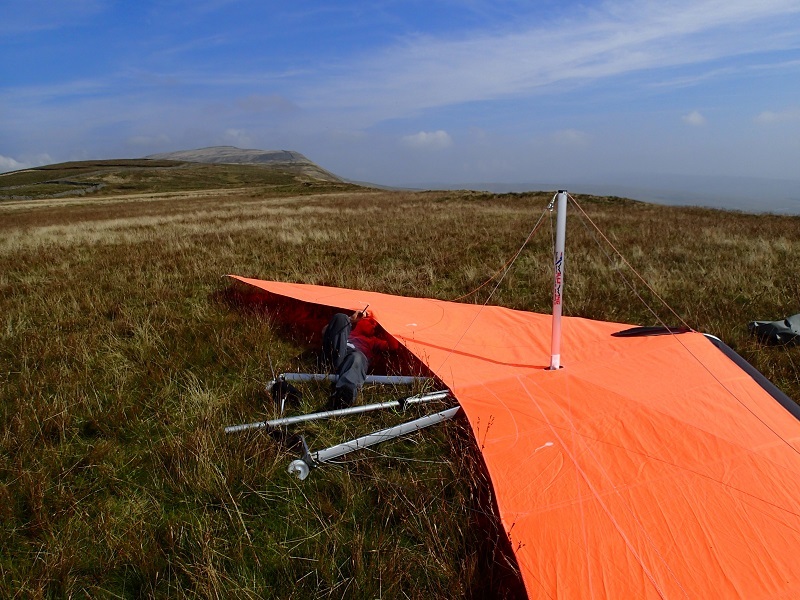 Classic British method of rigging with the glider flat on the ground. The air was very murky, but actually blowing on the hill properly for a change. I got up high 400-500m above take off three times. This is about 8 minutes later after I lost my altitude and was now below the ridge again. I don’t have enough experience to tell whether this was my fault through incompetence, or whether it was unavoidable. That’s one reason to have other people in the air. 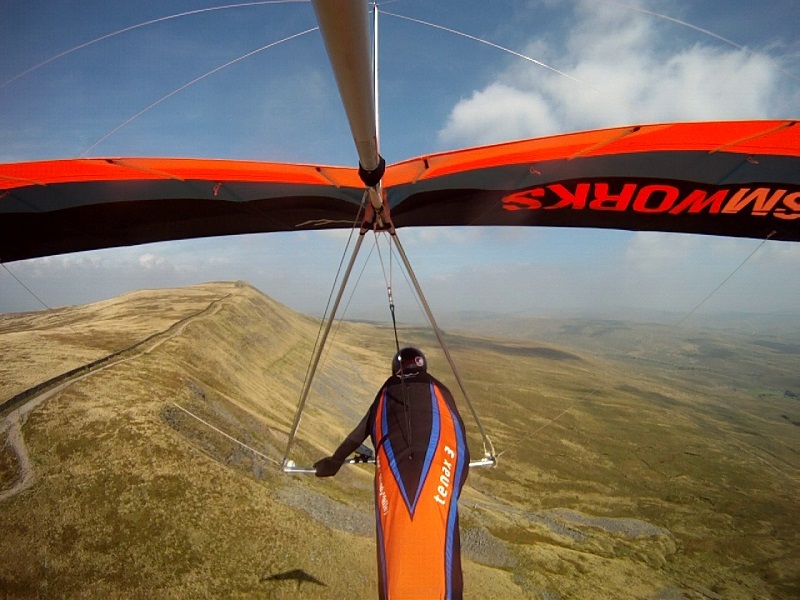 I had to pack up early, and flew straight out from the ridge against the wind to land just the other side of Low Sleights Road by Ribblehead, which was not bad going. I cannot get over just how barren and bleak this landscape is. Is it all because of the sheep, because otherwise it would be a total forest — as it is inside any enclosure?